Recipe for an enlightened week: A cup of yoga, a dash of meditation, a heap of vegetarian food, a dollop of Hare Krishna fire ceremony and a whole lot of digging. Mix well, and enjoy. 20 Jun Recipe for an enlightened week: A cup of yoga, a dash of meditation, a heap of vegetarian food, a dollop of Hare Krishna fire ceremony and a whole lot of digging. Mix well, and enjoy. 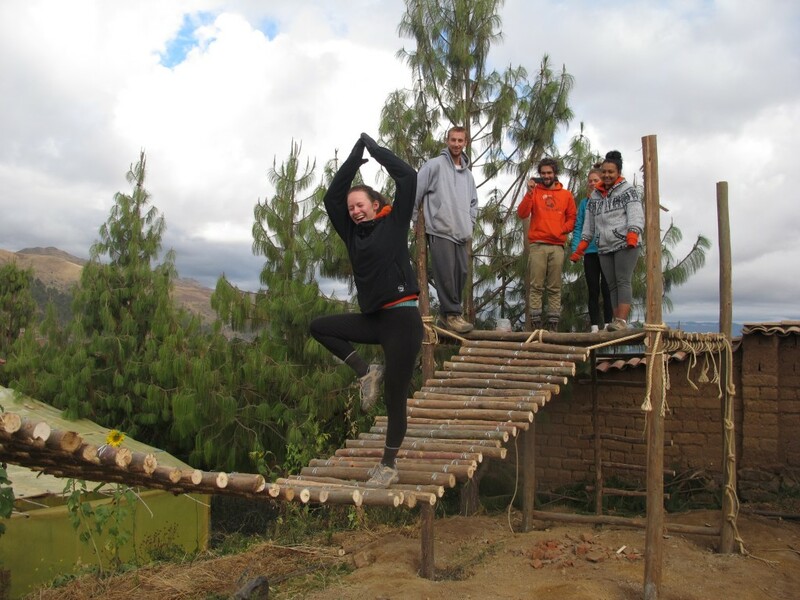 After an amazing three weeks of being outside our comfort zone, we finally make it to Sembrando Semillas Con Yoga, a yoga centre in Tica Tica, on the outskirts of Cuzco. For those of us that thought we would be in a familiar-ish setting, how wrong were we when we needed to walk along a railroad for a while, then climb a mini mountain to get to the facility. The OG experience continues. Working on the chain gang, digging out 5 x 10 meters of dirt! The complex is beautiful. 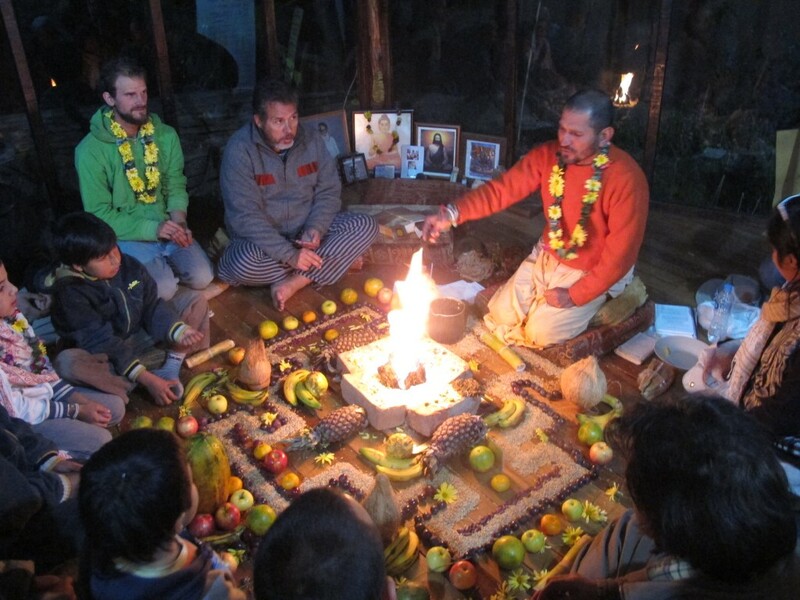 It is a communal living space that holds many volunteers and guests: several dorm rooms, a kitchen, a living room/dining area/common area, two dry toilets, many gardens and greenhouses, and a beautiful open concept yoga studio, also known as the temple. One shower for 22 people. The pattern continues, we shower once a week. Life is great. The lifestyle that we agreed to participate in during our stay is new for all of us: community living, a completely vegetarian diet, and no snacking. All food must be offered before tasting or serving, and the food must again be blessed before consumption. Luckily sanskrit is phonetic, and once we learn the melodies, chanting becomes second nature. With between 22 and 30 people at each meal, the energy of the centre is always strong, and mealtimes very social. And as much as the OG participants get along, it was really nice for us to interact with other volunteers at Sembrando as well. Many of them had been volunteering there long-term or had been traveling and volunteering abroad. Yoga in the morning was difficult because it was so cold outside. We had a rotation of teachers, including Christian and Marisol, the project’s directors, and each brought their strengths to our practice. The first class was a good introduction to those new to yoga, and the following classes brought more advanced poses and different sun salutations. After yoga we would learn about our chakras or practice breathing exercises. Yet another new experience for most of us was the meditation that followed, which I think was the hardest thing I have encountered on the trip thus far. In the evenings after dinner, Christian would read from the Book of Bhagavad gita, readings dedicated to the teachings of Krishna, which I can easily say left the majority of us more confused. Hill of dirt we moved over two days, bag by bag. Reference Nick at left for height of hill! We didn`t know that Sembrando Semillas practised Krishnaism, but I can’t stress enough that it was an amazing opportunity to witness. It just so happened that the Saturday that we were there (also Nour´s birthday), was the 3rd year anniversary of Sembrando Semillas Con Yoga and Nathan, Christian and Marisol´s son, was being initiated into the Hare Krishna religious practice. Thus, there was a huge celebration filled with traditional ceremony, chanting, dancing, music, fire, food, fruits and sweets, plus more chanting and dancing. It was magical and spiritual, and probably one of the most euphoric nights I´ve ever participated in. While they practice a life of modesty, celebrations are a huge deal. 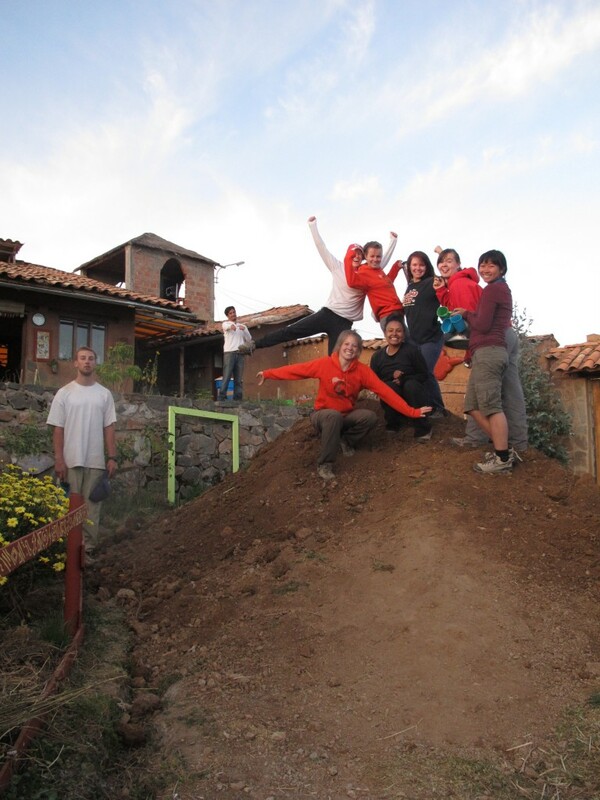 We were really excited to start project number three at Sembrando Semillas. We had a week to create the space for and construct a massive playground for the children out of nothing but our new favorite material, the eucalyptus tree! We started with a sloping hill and worked for two and a half days to pick and shovel a nice new flat surface for our creation. Three picks, four shovels, a humongous mound of dirt, and endless blisters later we had leveled the land as best we could and were excited to get our now calloused hands onto some tools. Every walk up the hill with a bag of dirt over our shoulders reminded us of how strong we hoped we would be for the upcoming Salkantay and Machu Picchu trek (at least it wasn’t cow poop)! Christian had designed a larger than life playground complete with two huge towers connected by a bridge and with space enough for swings, ladders, rope climbing, and hanging rings. We divided into teams to tackle this huge project. A bridge team, a tower team, and a hole digging and cementing team. We had one power saw to cut the wood and the rest was done with good old hammers, chisels, nails, wire, and rope. Many of us had never used these tools, making it such a rewarding experience to see how we could create such a structure with our own two hands. 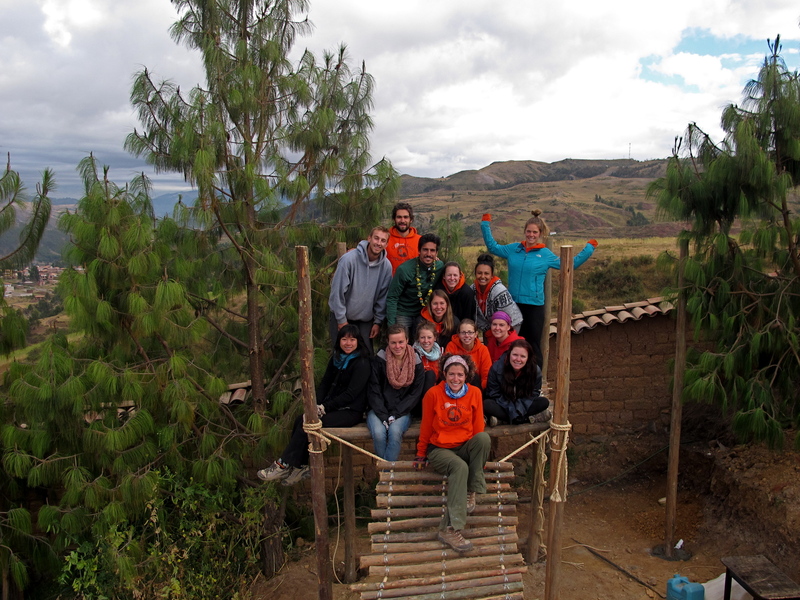 We spent days cutting eucalyptus to size to serve as posts, platforms, and bridge rungs. We hand chiseled numerous joints to make the structure as strong as possible and when in doubt added rope and nails to reinforce it. The two towers were cemented into impressively deep holes, strong enough to hold up platforms that rose above the fenced in land and overlooked the fog filled valley in the distance. The bridge took days to wire onto rope and required an entire team effort on the final morning to attach to the two towering towers. We all celebrated with a frightful, ceremonious walk, one by one, across the bridge. It still needs the guard railings and the swings and rings to be hung, but all in all it is turning into a child and adult wonderland! We cant wait to see the pictures of the final project complete with children hanging off every part we worked so hard to create! 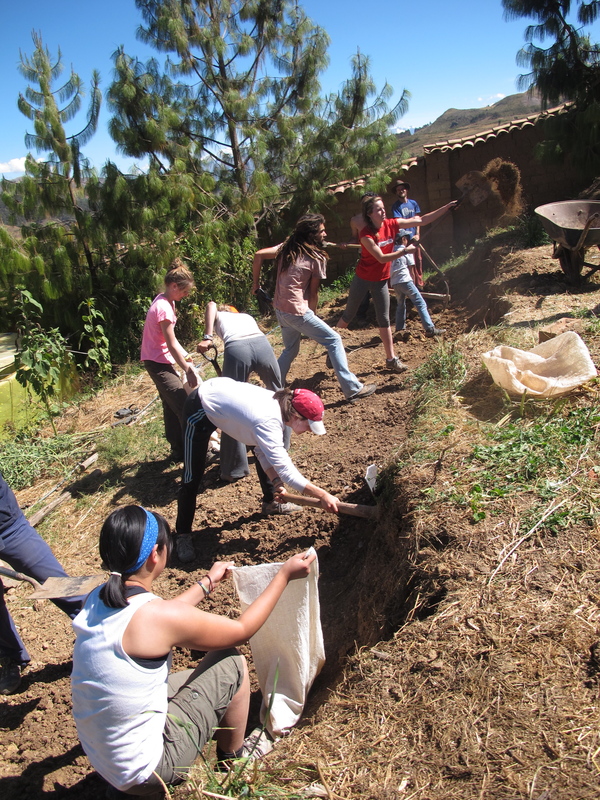 After we excavated and leveled the ground for construction, smaller projects and opportunities came up that a few volunteers could learn from. 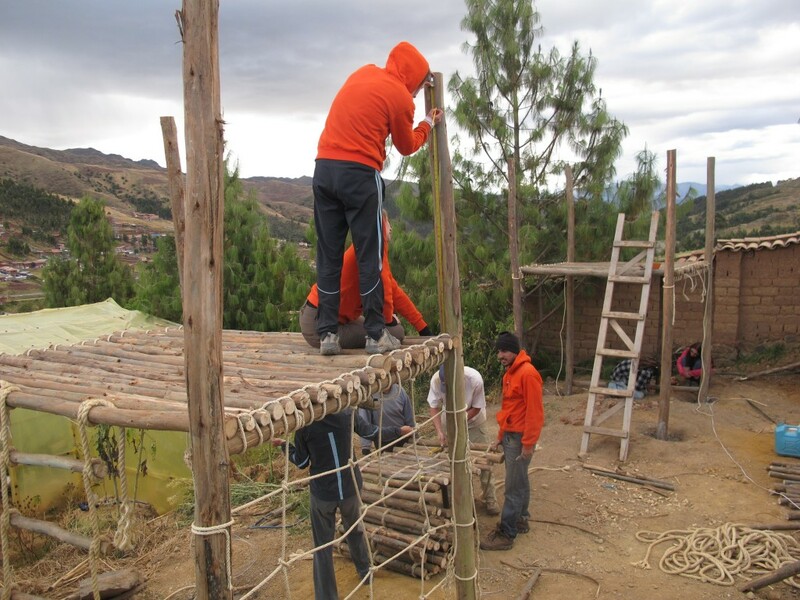 While the main group constructed the playground, some of us rotated out to learn how to create garden beds, transplant baby carrots, construct chicken pens, maintain gardens and greenhouses, bake bread, and mold adobe bricks from dirt. One of the best parts of the trip so far was when Rachel and I baked a cake for a neighbour who had taught us adobe brick making (which was muddy and glorious), and his sister welcomed us into her home, which was a one room house, complete with dirt floor, two beds, kitchenette, and guinea pigs in the corner. It was such a real experience, and she parted us with small trinkets to remember her by. As if we would forget her hospitality! And this is what traveling is about: these real life culture exchanges. Not the sightseeing and photo opportunities. Life is about connections.